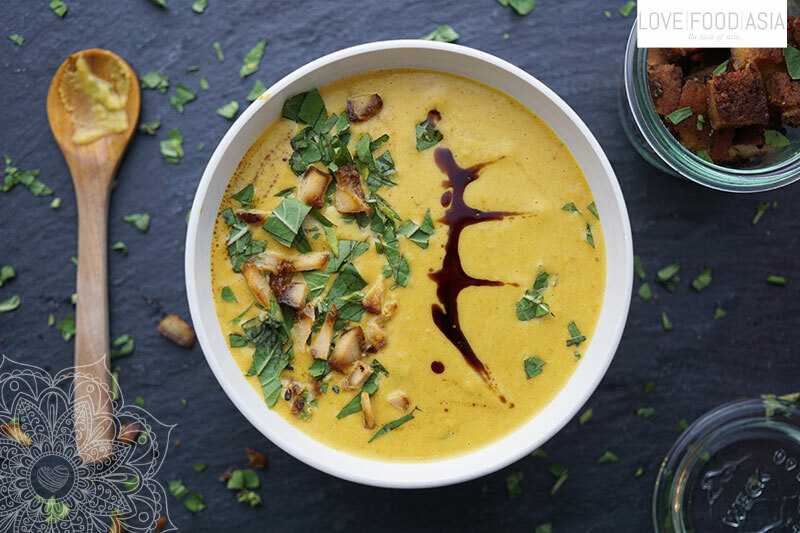 Creamy Thai Sweet Potato & Carrot Soup | Love.Food.Asia. This Thai-spiced creamy and vegan sweet potato soup with carrots and crispy tofu is super simple and very delicious. A perfect winter delight with a kind of special falavor. With just a handful ingredients you get a warming soup that can be served for a dinner to impress your family or friends. The taste adventure behind our soup is the combination of the Thai flavors and the baked carrots and sweet potatoes. First heat oven to 220 °C and place sweet potatoes and carrots into a large roasting tin, drizzled with sesame oil, tumeric and cumin. Roast veggies in the oven for 20 minutes or until tender and lightly crispy. Meanwhile heat peanut oil in a sauce pan and stir fry onions and palm sugar until golden brown. Add garlic and stir for 1 minute. Deglaze with veggie stock. Now add yellow curry paste and simmer for 5-10 minutes. Pour coconut milk into saucepan and bring to simmer. Once the roasted veggies are done, leave to cool a little, then transfer to the saucepan and use a hand blender to process until smooth. Taste with soy sauce and serve with fresh Thai basil and a dash pumpkin seed oil. Our Crispy fried tofu with black cumin seeds are a good side dish for this soup.